The Words of St.Padre Pio: It would be easier for the earth to exist without the sun than without the holy sacrifice of the Mass. 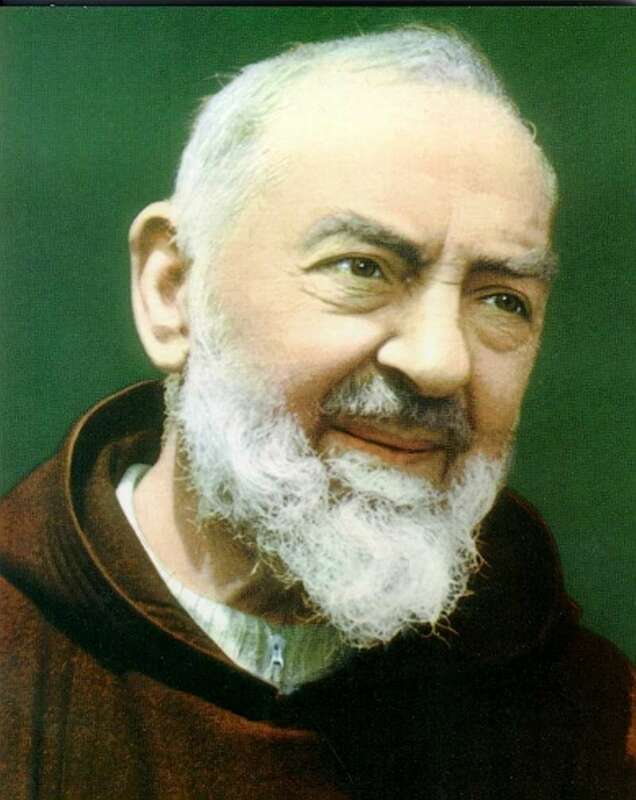 Francesco Forgione, better known to the world as Padre Pio, was born on the May 25. 1887, at the small village of Pietrelcina, near Benevento in Italy. The family was poor, but his father, seeing how quiet and religious his son was, determined that he would not end up labouring in the fields and travelled to New York to earn sufficient money to send Francesco to a seminary. As a result, Francesco entered the Capuchin Monastery at Morcone in 1902 to begin his year of novitiate. He was fifteen years of age. 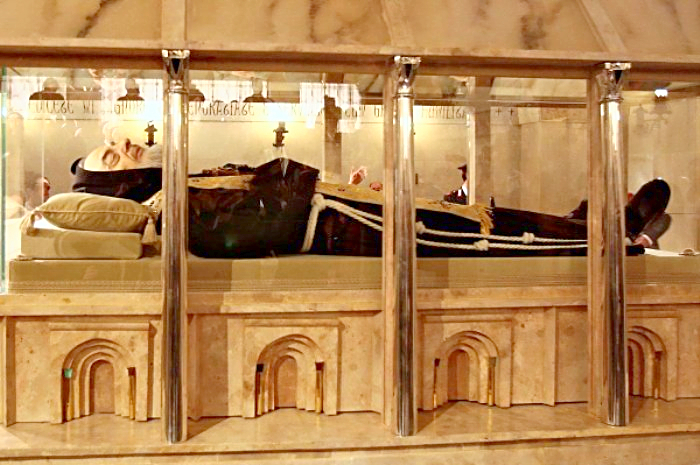 On the 20th September, 1918, Padre Pio collapsed in the chapel and was found to be bleeding profusely from five deep wounds in his hands, feet and side. When he regained consciousness he begged his fellow monks to keep the event secret, but word soon spread and people flocked to the monastery from all over the country to see the stigmata for themselves, and to confess their sins to this living saint. 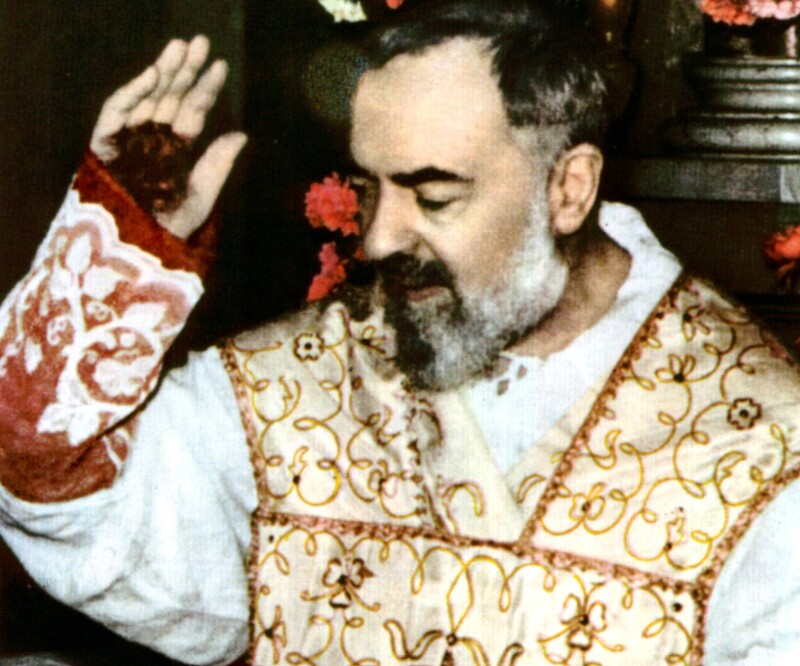 During the next few years Padre Pio was forced to endure a series of medical investigations and attempted cures, none of which changed the character of the wounds. He never talked about himself or complained, but when someone foolishly asked him if his wounds hurt, he replied: Do you think that the Lord gave them to me for a decoration? 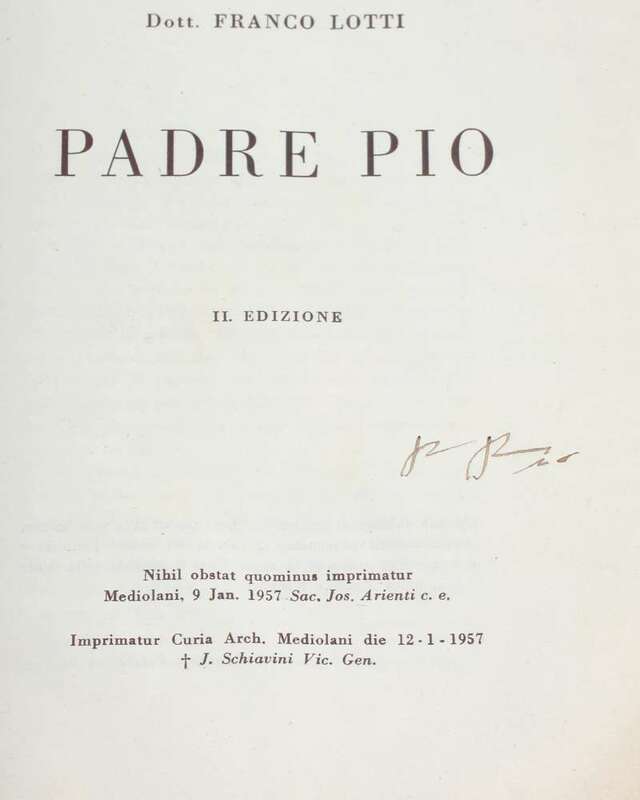 A Booklet about St. Padre Pio signed by him. 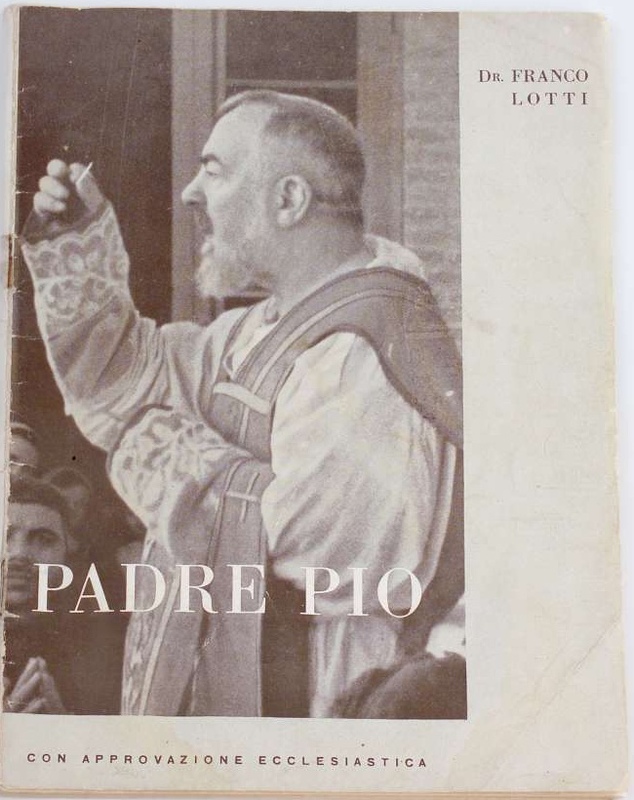 It was written during his lifetime and is signed on the title page Padre Pio. It is undated. Padre Pio who lived from 1887 to 1968 was a stigmatist for fifty years. A stigmatist bears the wounds of Christ in his body. He was recognized world wide for his sanctity. An autograph of his is rare and invaluable because he is so popular in Italy even though he died such a short time ago. In spite of such afflictions this humble monk lived an extremely busy life. Rising at 3:30 every morning, he said Mass at 5 a.m., had no more than a glass of water for breakfast, and spent long hours hearing confessions. At noon he took the only meal of the day. Although he never left the monastery in a physical sense, he was observed at different places many miles away on numerous occasions. Thus he possessed a gift shared by very few saints, that of bi-location. Sometimes he appeared beside someone he wished to help; at other times he made his presence felt by the perception of a singular fragrance. This was noticed by everyone in the vicinity at the time. 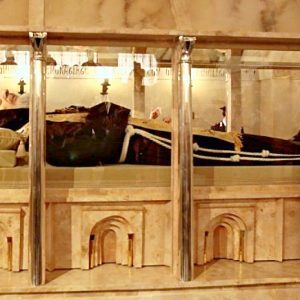 If in view of his many achievements this Italian friar appears as something of a formidable character, it should be mentioned that he had a vigorous sense of humor and was most popular with his religious colleagues and friends. He did not consider himself superior to anyone else, and indeed showed considerable humility. When people sought to thank him for some special favor, he humbly asked them to pray for him. Padre Pio died on the 23rd September, 1968. His funeral, held three days later, was attended by more than 100,000 people. Pope John Paul II took particular interest in his cause and he was beatified on May 2nd, 1999. 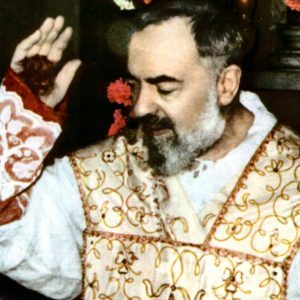 Three years later, on June 16th, 2002, Padre Pio was canonized. He became – officially – a saint who was canonized by the pope who in his young life as a priest actually went to confession to him. You may read Pope John Paul II’s homily at the canonization on several internet sites. St. Padre Pio’s feast day is celebrated on September 23rd. Prayer is the best weapon we have; it is the key to God’s heart. You must speak to Jesus not only with your lips, but also with your heart. In fact on certain occasions you should only speak to Him with your heart. www.mysticsofthechurch.com for his kind permission in allowing us to reprint the biographical information of St. Padre Pio. Growing up, I was obsessed with Johnny Cash. My parishioners would say that I still am, and admittedly that’s probably true. I love the Man in Black. I jokingly tell people that I have worn black every day since he died (which is also true). When I was young and still in the practice of going trick-or-treating, I was Johnny Cash pretty much every year except for one. That one year I was the Fonze from the popular 1970s television series Happy Days. Arthur Fonzarelli, aka “The Fonze,” was simply the coolest thing that ever showed up on a television screen. Kids my age rarely would miss an episode, because The Fonze simply captured our imagination. Now cool is hardly a theological term, but if it were used to describe one saint on the church’s liturgical calendar, it would have to be St. Pius of Pietrelcina, universally known as Padre Pio. Padre Pio, whose feast day is September 23, died in 1968. He had all sorts of miraculous events surrounding his person, things that we would normally associate with saints from centuries past, like bilocation, levitation, reading of souls (telling people their sins before they confess them) and more. Yet he died in our own era. But what really grabs people’s attention about Padre Pio is that he had the stigmata for 50 years — the wounds of Christ on his body. He was the first priest in recorded history to have such a phenomenon. The word stigmata comes from a Greek word meaning a mark impressed by iron, something like the branding of cattle. Believe it or not, the word actually appears in the New Testament, when St. Paul wrote, “I bear the marks of the Lord Jesus in my body” (Galatians 6:17). This verse has caused some people to ponder if St. Paul himself had the stigmata, though there really is no indication that he did. As famous as Padre Pio is for the stigmata, he is not the most well-known saint to have experienced it. St. Francis of Assisi is the first saint said to have had this phenomenon. His wounds appeared only in the last two years of his life, following an ecstatic vision. There are different traditions, but one states that his disciples did not even know about it until they saw them on his body after he died. What might surprise some readers is that the church has never made any definitive statement on the miraculous nature of stigmata. In fact, often claims of stigmata have rightfully received a cool reception. St. Francis de Sales, in his book Treatise on the Love of God, refused to define the phenomenon as miraculous. What’s more, Pope Benedict XIV in the 18th century was cautious in attributing stigmata to sanctity. This is clearly true, since many of the great saints, such as Therese of Lisieux, John Vianney, John Paul II and many others, never experienced anything resembling stigmatization. Sceptics of the miraculous nature of the stigmata cite the fact that every documented case of it followed an intense ecstasy, which points to the possibility that stigmata could be explained as a result of an intense psychological experience. Obviously sceptics do not take the stigmata as a point of faith. Doubtless there have been many frauds throughout history who have claimed to have the miraculous marks of Christ on their body, so it is healthy to be skeptical. But just as the church does not make an official statement on the authenticity of the Shroud of Turin, so it is not going to make an official statement on those who experience the stigmata. Whether the stigmata is supernatural or a result of something more physiological can still be debated. But there is one thing the stigmata most certainly is not: an historical portrayal of the wounds of Christ crucified. No two persons have had the exact same marks on their body. Some have had them in the form of a square, while others have had circular marks. Some have had the marks on their wrists, while others have had them on their hand. Some have had the wound on the left side of their chest, while others have had the wound on the right side. 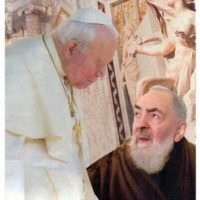 We are wrong to look at someone like Padre Pio and conclude that that is the way it must have been for Jesus. Personally, I think the stigmata certain saints have experienced are most likely of a miraculous nature. At the very least a saint would not fake such an occurrence. However, the claims of people who profess to have the wounds today (and there are many) I would take with a big grain of salt. Either way, we see in Padre Pio and other such saints a clear and tangible sign of Christ’s love for us in his suffering, and that is our take-away from such a phenomenon. And that’s pretty cool.